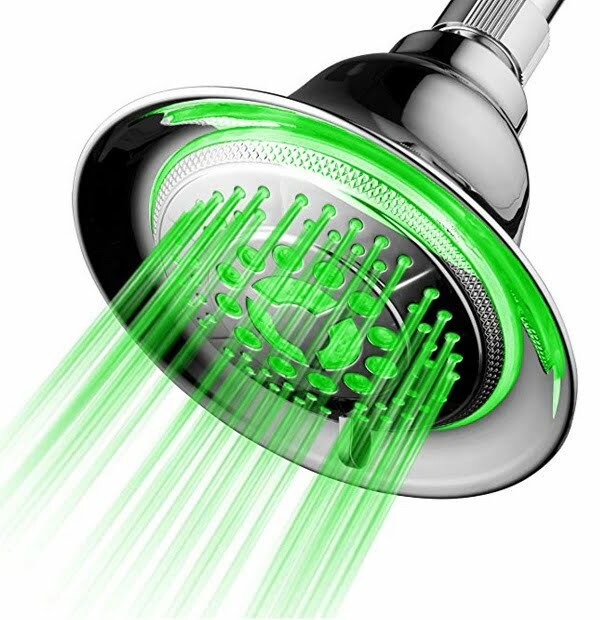 Looking for the best LED shower head? After extensive research, we’ve made the top 10 list of the best options of every type of LED shower heads in 2019. If you want to turn your bathroom into a spa, one of the options you have is getting an LED shower head. Granted, it’s just a small part of bathroom decor, but it can have a big impact. It’s a lot of fun too! From colored lights for the show to functional LED shower heads. We have covered all types of accessories based on several criteria, such as lighting, water filtering, make and ease of installation. We’ve done all the hard work, so you don’t have to! When it comes to LED shower heads, DreamSpa is the pioneer in the field. Their shower heads are showroom worthy and functional. So if you’re looking for a quality product, you can be sure you’ll get it here. This chrome faced LED shower head changes color based on temperature. You’ll quickly get used to it. Blue means cool, green – warm, red – hot. Pulsing hot indicates a very hot temperature that can be dangerous. No getting burnt or unpleasantly chilled again! The lights are water powered, so there’s no need for batteries ever. 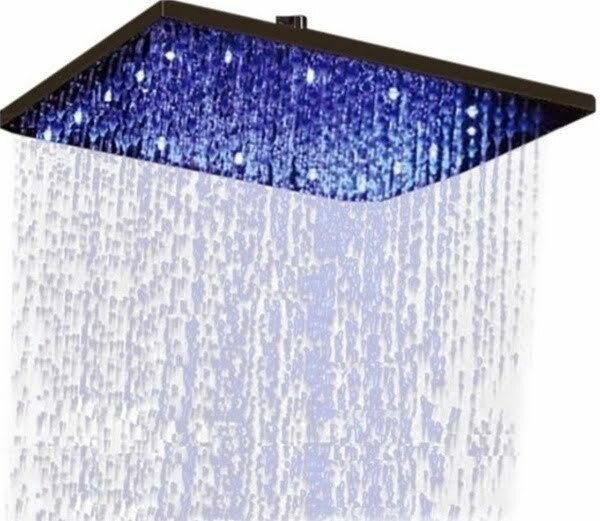 In addition to all its features, you’ll love getting a shower in the dark while enjoying the romantic colored LED lights of this shower head. Why it’s our pick? It’s Amazon’s choice and we agree to it. Over a thousand positive customer reviews can’t be wrong. Available on Amazon. 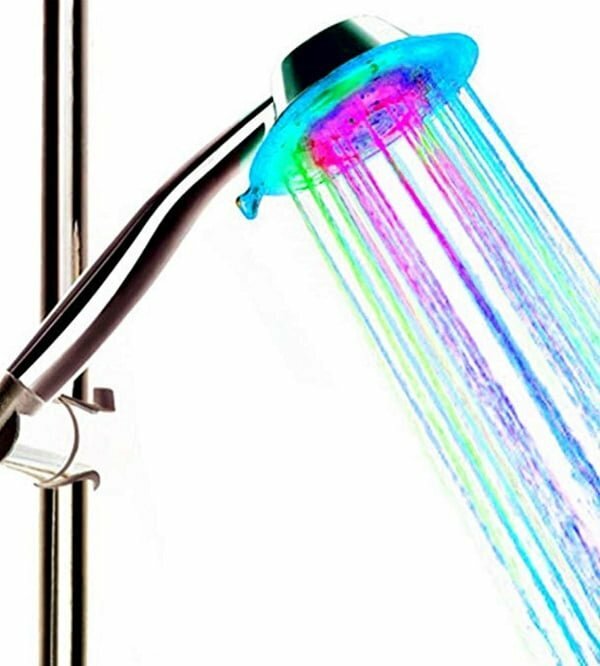 This LED shower head burst in color! It’s an excellent option for your kids’ bathroom. Well, we’re pretty sure adults will enjoy the shower disco as well! 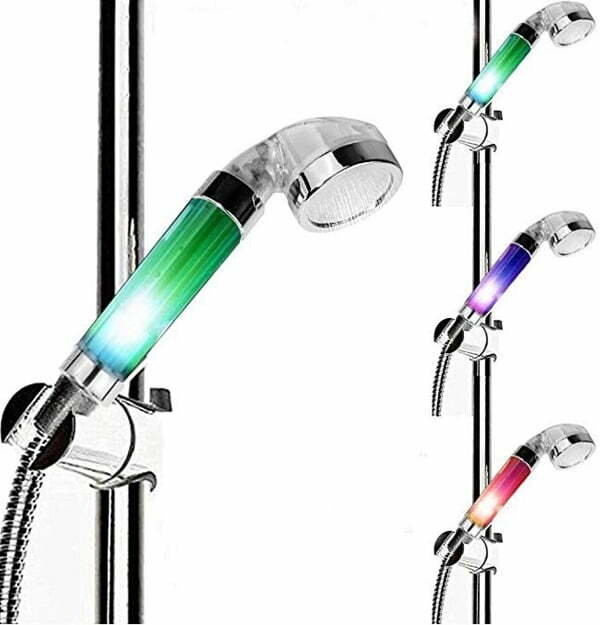 This handheld showerhead comes with 7-color LED lights that will change color automatically with water pressure. There’s no need for batteries as well – it’s water powered. And while the colors don’t indicate water temperature, it’s still a lot of fun. On top of the fun lighting, it has three water pressure modes to choose from. Why it’s our pick? It’s a fun choice for a handheld LED shower head. The 7 changing colors is a sure hit among kids. It’s available on Amazon. 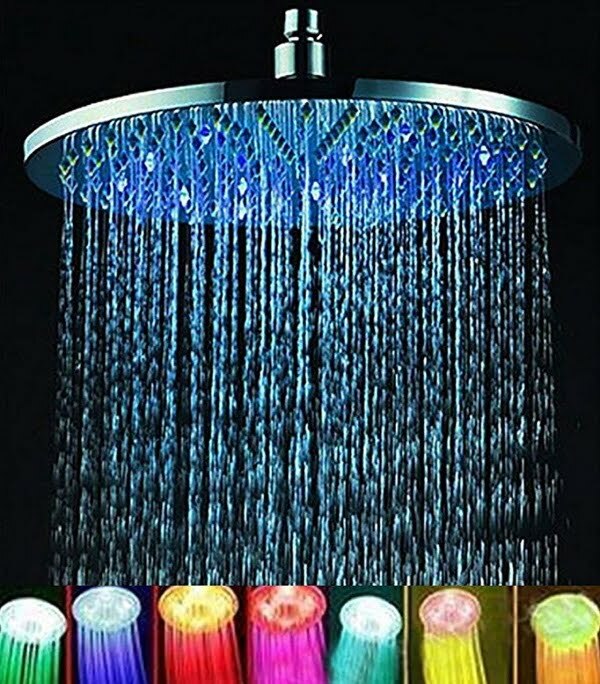 Here’s another great LED shower head from DreamSpa that will help you make your bathroom look more like a spa. The elegant curved design is one of the best qualities of this product. And while it’s made of chrome plated plastic, you can tell it’s a well-made product right away. The shower head comes with an LED screen that reads water temperature as well as provides lighting. Just like other DreamSpa shower heads, the light color indicates water temperature as well. If you want to shower in a spa-like colored rainfall in your very own bathroom, this choice is yours. Why it’s our pick? It’s a great multi-functional rainfall LED shower head in an elegant design. Available on Amazon. If you’re looking for something more robust so to speak, this stainless steel LED shower head is for you. Unlike its plastic counterparts, the metal construction makes it more durable. It’s also a full-size rainfall showerhead. The LED lighting changes color automatically on water pressure. The lighting is purely decorative and doesn’t provide any function. It’s still pretty cool and spa-like. Choose this shower head if you’re looking for this kind of design for your bathroom decor. Why it’s our top pick? It’s a big rainfall LED shower head made of stainless steel in a slick design. Choose this product for a spa-like decor and comfort. Available on Amazon. If you’re looking for more function in your new LED shower head, this is a great option. 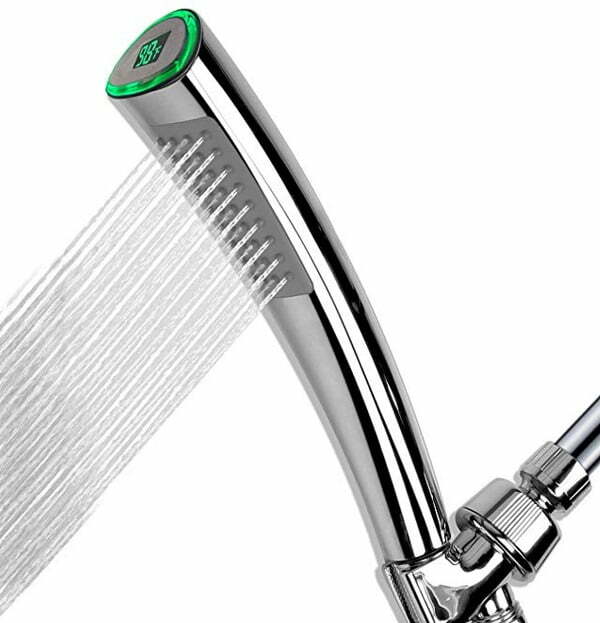 It has all the features you want from a showerhead and more. The transparent handle is decor neutral and looks good at the same time. The LED lights change depending on water temperature. It’s a sure way to create a romantic or spa-like atmosphere in your bathroom. In addition to that, this product has water ionizer and filter to keep water clean. Why it’s our pick? It’s one of the best options for a feature packed and easy to install LED shower head. Available on Amazon. If you want something simple but fun, the Vomercy handheld LED shower head will do. It’s a simple chrome plated design that looks good and feels good. The cycling LED light colors will make your showering fun without going on a splurge. It’s one of the cheapest options too, so it’s perfect if you’re on a tight budget. Why it’s our pick? The Vomercy LED shower head is a simple and affordable choice to fancy up your bathroom. Stellar reviews on Amazon make it an attractive purchase. Available on Amazon. 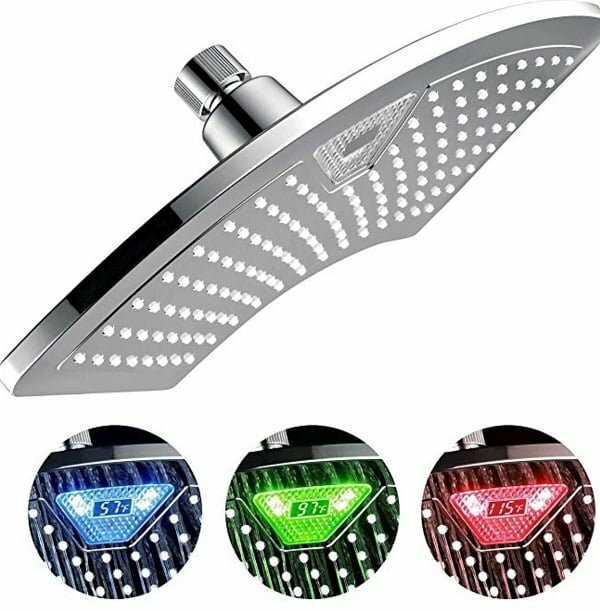 If you’re looking for a real light show in your bathroom, then this LED shower head is right for you. It’s a large (8 inch) rainfall shower head that lights up the entire bathroom. When showering in the dark, there’s no other lighting needed. 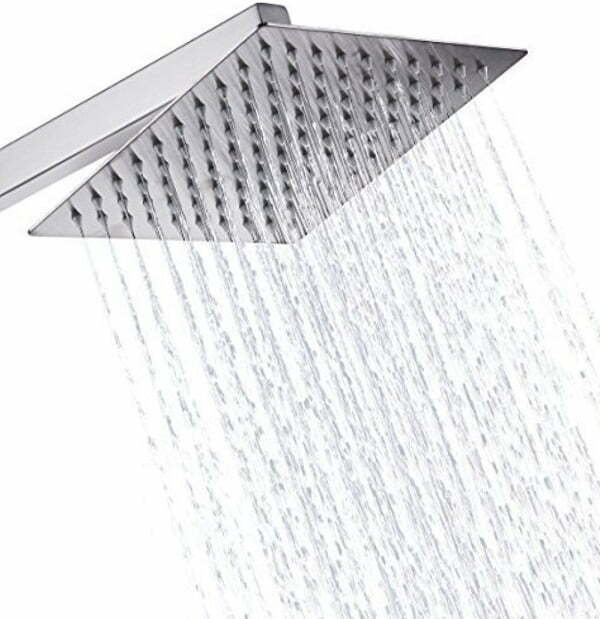 The shower head is made of rust-resistant material and is one of the quietest working heads on this list. It’s an affordable option for its size. Why it’s our pick? 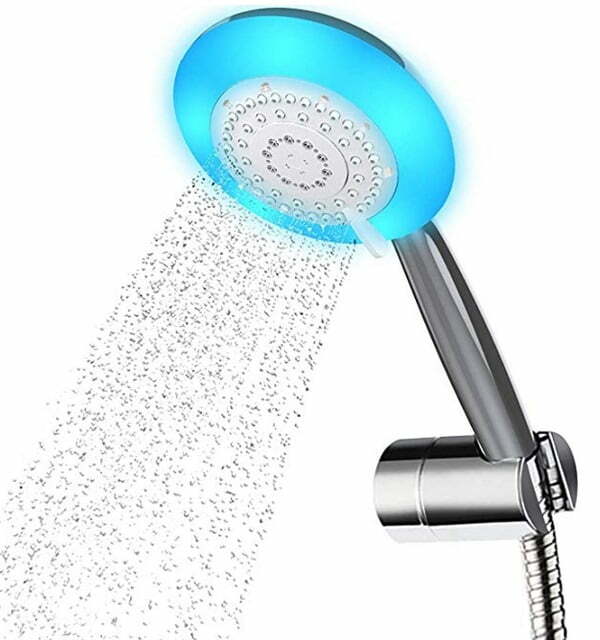 This LED shower head is big anough to light up the bathroom when showering in the dark. It’s also available on Amazon. The CNASA LED shower head must be the most affordable product on this list. But don’t be fooled by the price – it’s a full-featured showerhead. It includes the water temperature controlled lighting, water powered LED, water filter and an easy to clean detachable design. What more do you need? The transparent handle design might leave something to be desired for as far as the decor value goes. But you get what you paid for. And you get a pretty decent product! Why it’s our pick? It’s the cheapest LED shower head you will find. But it still offers excellent features. Over 400 positive Amazon reviews agree with this pick as well. Available on Amazon. Are you one for high-quality design? While this LED shower head might be a bit pricey, the quality makes up for it. The product has all the features you need. The full-size rainfall showerhead provides the perfect showering experience. The water-powered LED lights change color based on water temperature. There’s a built-in water filter to keep the water always clean. 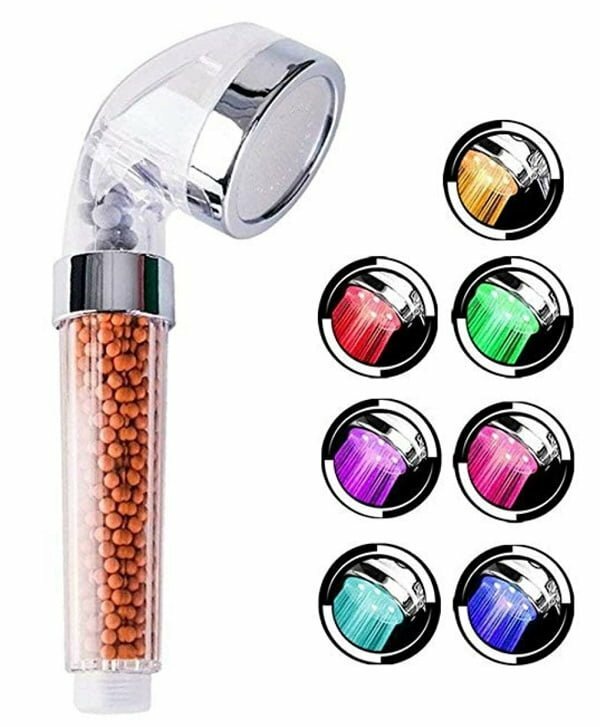 It’s a great shower head for your home spa. Why it’s our pick? It’s the best quality product on the list. If you need a luxury accent in your bathroom, you have to go with this LED shower head. Available on Houzz. If you’re one for function rather than the show, you might not want all the colored lights. This LED shower head provides a thermometer display for water temperature. This product is designed for performance and works well. Made from antibacterial resin with a luxury finish it provides the best showering experience. With this design YOO.MEE advocates healthy showering. Why it’s our pick? It’s a different kind of LED shower head and we like variety. It’s a great option if you’re interested in more function than the show. Available on Amazon.